Jeffrey Grosset established the isolated and windswept Gaia Vineyard in 1986. 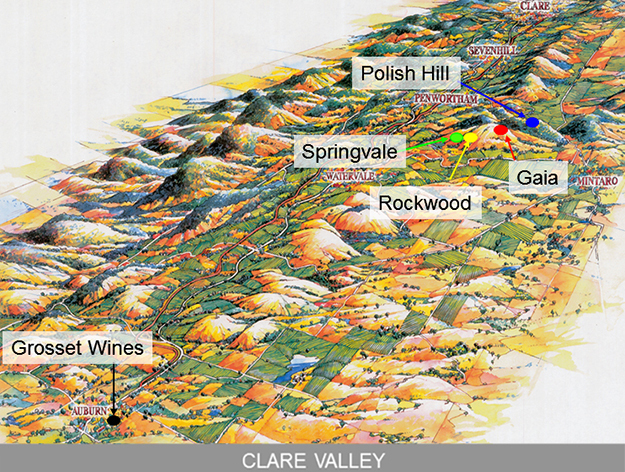 Planted at an elevation of 570 meters, it is the highest vineyard in the Clare Valley. Consisting of two hectares of cabernet sauvignon and cabernet franc, this strikingly beautiful site is extremely challenging and requires careful management. Hard red rock predominates, and the rocky outcrops that break through the earth prevent inter-row cropping and weed control through tillage. Instead, seed is broadcast by hand and grasses and clovers encouraged to regenerate. Close-planted at 3000 vines per hectare, the yield is about two kilograms per vine; less than two bottles of wine. That vines manage to grow here at all is something of a marvel, let alone the quality and consistency of the fruit they produce. Grosset named the vineyard ‘Gaia’ after scientist and environmentalist James Lovelock’s theory of symbiosis, which posits that the earth is a single living organism of immense complexity; one that depends on the full diversity of its species to remain in balance, sustain its ecological health, and restore itself in the face of the changing environmental conditions precipitated by human activity.